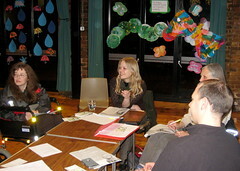 Sian Berry began with Ken Livingstone’s new announcement that he would set a £50 million budget for cycle transport, allowing £63 million in the year 2009-2010 then £50 million p.a. subsequently. £50 million a year would pay for the introduction of major cycling commuter superhighways. She said that the Greens would triple this budget to £150 year. She advised cyclists not to underestimate Boris Johnson! Although London’s 14 constituencies elect assembly members on a roughly proportional basis, the Conservatives will always have more than half the Assembly members. The Green Party currently has two members and should get a third or even better, a fourth next time around. Boris Johnson will want to keep the cycling budget down. Paddick is sending out mixed messages about cycling, for instance he would allow motorbikes and cabs as well as bikes to use bus lanes. How to reach that target of 30% of all journeys travelled by bike? The present target for London is 5% of journeys to be taken by bike. Berlin has already achieved this and in Copenhagen they have already reached 30%. Introduce street bikes. The size and contours of London make it difficult to travel everywhere by bike. 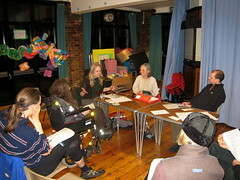 Sian gave an example of travelling to several appointments on one day in Kensington, Westminster, Islington and Archway. Bikes for hire on the streets allow the passenger to choose, to look at each journey and not tie ourselves to cycling every stage of the journey. Paris has 20,000 cycles for hire already; the current plan for London is to introduce 6,000 by 2010 which is not enough. *Persuade people who don’t cycle to ride*. At least 30% of Londoners have a bike; the next step is to persuade them to use it. We need lifts at tube and train stations; London Overground stations could be fitted with lifts by 2020. Better signage for tourists and random cyclists who don’t know their way around. Superhighways: how to persuade local councils to reduce car parking. Increased use of car clubs will reduce parking. Rik Andrew said that in Westminster the council won’t take out parking on one side of roads to allow space for a wide cycling lane. The car club strategy is to reduce the numbers of parked cars. Oliver Schick pointed out that we live in a democracy and people want luxury. The Green Party tries to define what is for the common good, based on the concept of justice. But politicians put forward policies based on their estimates of what people will want. 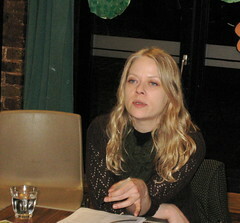 Sian Berry argued that Brian Paddick’s proposals come from lobbyists: car drivers, cab drivers – not necessarily what the community wants. Car clubs would increase access to cars for the many who can’t afford one but would like the use of a car late at night or for special occasions. Ken Livingstone’s policy would be to have a car available for half of all people in inner London by 2012. Stefano suggested targeting second cars with a heavy tax. Then if a second is needed, people could use a car club. Also higher residents’ permits for gas guzzling vehicles. Dominic argued for a much more aggressive policy to increase cycle parking. Oliver said in Holland with planning for new suburban development they expect motor traffic to increase by 25-30%. London is very illegible in terms of maps and planning. They need help with mapping their journey. Sian argued the case for permeability: maximum route choice and minimum diversion. This would outlaw major gyratories and one-way systems (cyclists hate them), dropping kerbs and introducing cycling gaps. The congestion charge: she estimated that 17% of car drivers will be hit by the £25 pollution charge hitting gas-guzzling cars. The effects will have to be monitored. Her policy would be to stop the policy after a year to allow drivers to downsize, then reduce the charge. She would offer incentives for provision of cycle parking at the workplace and outside shops (which often own an area of pavement). The pros and cons of shared space (equal open access to pedestrians, cyclists and motorists) were aired. The meeting made up for its lack of numbers with animated contributions from all, giving both speaker and audience plenty to think about. After which most of the meeting adjourned to the pub.